Yes, you read that right, turnip kraut. That is my most recent historic food experiment. 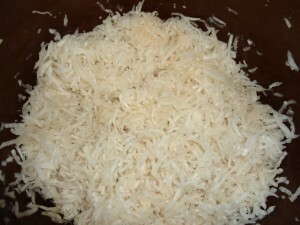 Turnip Kraut – my first try at fermenting turnips. I’ve made sauerkraut for years, the old way, nicely shredded cabbage layered with salt and allowed to naturally ferment in a crock. I had read and heard that it could be done with turnips and I always wanted to try that. And then like magic the turnip fairy came and brought me about 25 pounds of turnips. So when I found the turnips on the porch I knew what I had to do. By the way Nic Welty runs a nice farm around here called 9 Bean Rows. And some have said they have seen him drop off turnips on porches, although I’ve never seen that myself. I don’t have to see it, I believe in the turnip fairy! Now-a-days ‘krauting’ is called lacto-fermentation or cultured vegetables. It is all essentially the same thing. It is a way of preserving vegetables. Pickles use vinegar. Jam uses jelly. Kraut uses fermentation. The two recipes are very similar. I opened up my crock of turnip kraut today…… well not quite. I tried to open it up but the wooden disc I put inside to keep the kraut down under the brine was swollen stuck! I paused for a moment and wondered what will I do? Then it dawns on me; I should ask the guys at Woodbine to help me. Woodbine is this amazing place in Suttons Bay where lumber is turned into furniture/art/apple butter paddles, machines are refurbished or reinvented, old boats are made new, flesh forks are straightened, unique metal parts are fabricated for making cider and many more wondrous and amazing miracles that I can barely understand. The machinery there astounds and there is this really nice cat named Oliver. I knew those guys could get that disc out of my crock. Those guys are great. Jim, Gary and Fred, in intervals tried a few different approaches, which was all very entertaining. In the end a small saw was produced and the disc was removed without damaging the crock or the turnip kraut. Gary and I tasted some right away and were both quite pleased. It is nice to know that a girl like me can get a little help at place like Woodbine. It is all is so serendipitous. Jim, you know, is responsible for the beautiful built-ins in my house. 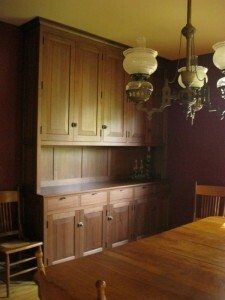 The dining room hutch that Jim built. Made of walnut. Anyway – back to opening the turnip kraut… once the kraut was opened and it was tasted I have to say I am very pleasantly surprised. I’m not a huge fan of the turnip, cooked with other root vegetables it is pretty good. But man oh man, this turnip kraut is just the thing. Crunchy, tangy, a bit peppery hot, strong flavored, not too sour – oh my gosh I’m sold. I like it better than sauerkraut. It was not that hard to make and only took about 2 weeks to ferment. 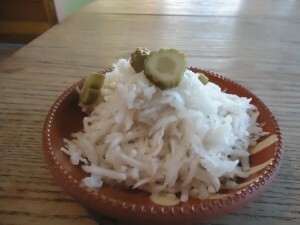 I plan to serve it as a relish with meals, I think it will go well with pork and poultry and sandwiches with meat. It would also be very nice with some dry cured sausages, cheeses, quince paste and a few walnuts and I think some Riesling. Turnip Kraut – I’m impressed. This entry was posted on Wednesday, March 12th, 2014 at 8:59 pm and is filed under Food, Hillside Homestead News. You can follow any responses to this entry through the RSS 2.0 feed. Both comments and pings are currently closed. 5 Responses to “Turnip Kraut” Comments are currently closed. Susan, I’ve also seen plenty of receipts for fermented vegetables in European sources. I’ve tried lacto-fermenting black radishes, which are also wonderful! Recently tried beets as well; they were a bit hard but tasty. Slicing them thin enough is the issue. now I must try turnips! oh that all sounds wonderful! Share a few of those title if you can. and I wonder when folks started calling it lacto-fermentation? I have this 1930’s book that calls it krauting or pickling! of course I love the krauting word! Maybe the beets could be grated like I did the turnips? Thanks for sharing. Thanks for the post. Now I am going to try turnips! Glad you liked it! I plan to serve some to some dinner guests tonight!